I am a jug filled with water both magic and plain; I have only to lean over and a stream of beautiful thoughts flows out of me. I was always lucky in my bad luck. Not until we're totally crushed do we show what we are made of. Writing is a defence against boredom, but it's also a cure for melancholy. The closest one person can get to another is through silence. For we are like olives: only when we are crushed do we yield what is best in us. I look on my brain as a mass of hydraulically compacted thoughts, a bale of ideas, and my head as a smooth, shiny Aladdin's lamp. 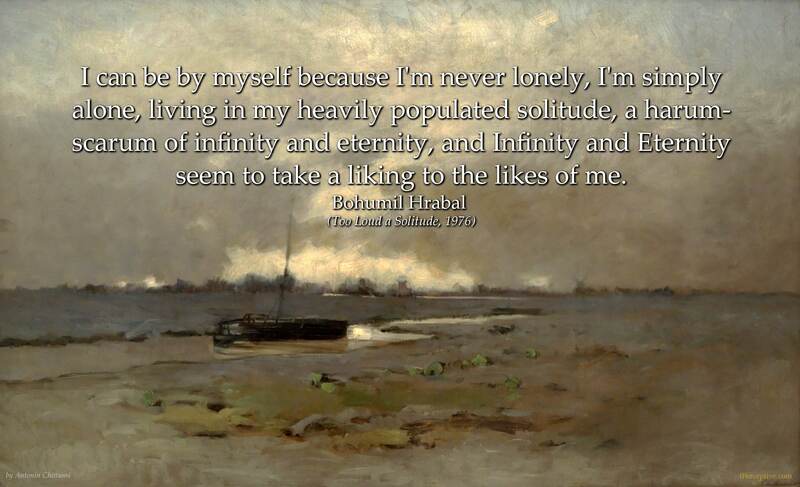 I can be by myself because I'm never lonely, I'm simply alone, living in my heavily populated solitude, a harum-scarum of infinity and eternity, and Infinity and Eternity seem to take a liking to the likes of me. Real thoughts come from outside and travel with us like the noodle soup we take to work; in other words, inquisitors burn books in vain. If a book has anything to say, it burns with a quiet laugh, because any book worth its salt points up and out of itself. One of her eyes was lower than the other, which gave her a distinguished look, and if she seemed to squint a little, it was not because she had bad vision but because one of her eyes had simply got stuck while staring beyond the treshold of the infinite into the very center of an equilateral triangle, into the very heart of being, or, as a chatolic existentialist put it, her defective eye symbolized the diamond's eternal blemish. I always loved twilight: it was the only time of day I had the feeling that something important could happen. All things were more beautiful bathed in twilight, all streets, all squares, and all the people walking through them; I even had the feeling that I was a handsome young man, and I liked looking at myself in the mirror, watching myself in the shop windows as I strode along, and even when I touched my face, I felt no wrinkles at my mouth or forehead. Sometimes when I get up and emerge from the mists of slumber, my whole room hurts, my whole bedroom, the view from the window hurts, kids go to school, people go shopping, everybody knows where to go, only I don't know where I want to go, I get dressed, blearily, stumbling, hopping about to pull on my trousers, I go and shave with my electric razor - for years now, whenever I shave, I've avoided looking at myself in the mirror, I shave in the dark or round the corner, sitting on a chair in the passage, with the socket in the bathroom, I don't like looking at myself any more, I'm scared by my own face in the bathroom, I'm hurt even by my own appearance, I see yesterday's drunkenness in my eyes, I don't even have breakfast any more, or if I do, only coffee and a cigarette, I sit at the table, sometimes my hands give way under me and several times I repeat to myself, Hrabal, Hrabal, Bohumil Hrabal, you've victoried yourself away, you've reached the peak of emptiness, as my Lao Tzu taught me, I've reached the peak of emptiness and everything hurts, even the walk to the bus-stop hurts, and the whole bus hurts as well, I lower my guilty-looking eyes, I'm afraid of looking people in the eye, sometimes I cross my palms and extend my wrists, I hold out my hands so that people can arrest me and hand me over to the cops, because I feel guilty even about this once too loud a solitude which isn't loud any longer, because I'm hurt not only by the escalator which takes me down to the infernal regions below, I'm hurt even by the looks of the people travelling up, each of them has somewhere to go, while I've reached the peak of emptiness and don't know where I want to go. 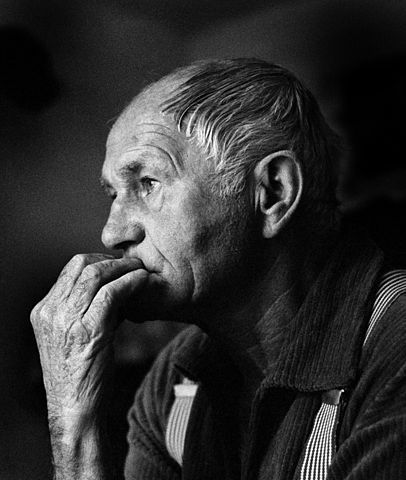 Bohumil Hrabal was a Czech writer, whose works have been influential in the Czech Republic and world-wide as well.